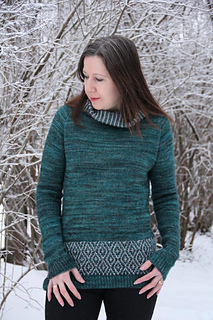 Beautifully patterned, timeless sweater, worked seamlessly from top down. Although it may look complicated at first, the stitch patterns are actually very easy, you will never use more than one color at a time. 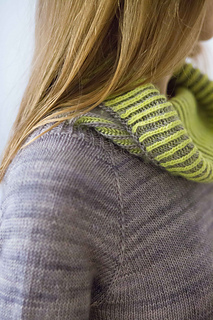 The collar is worked in two-color Brioche stitch and the pattern at the bottom of the body is worked in Slip-stitch technique. 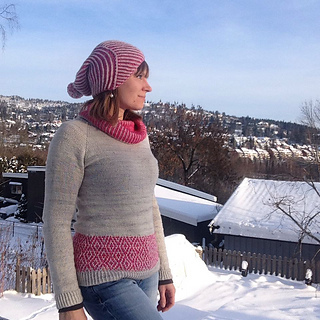 The pattern includes photo tutorials for lifted increases, German short rows and Brioche stitch. The Slip-stitch pattern is both charted and written. The sample is worked without waist shaping but instructions for waist shaping are included in the pattern. 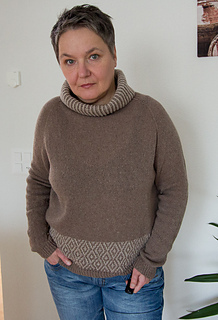 Bust circumference of the finished sweater: 30 ¾ (34 ¾, 38 ¾, 42 ¾, 46 ¾, 50 ¾)” / 78 (88, 98, 108.5, 118.5, 129) cm. The sweater is designed to be worn with approximately 2 ¾” / 7 cm of positive ease which is already built into each size. 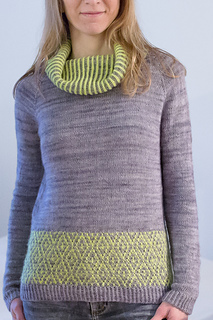 Shown in size S.
Please note that the gauge is measured after blocking. 1 chain stitch equals 2 worked rounds which means that for every 4” / 10 cm there are 26 chain stitches. 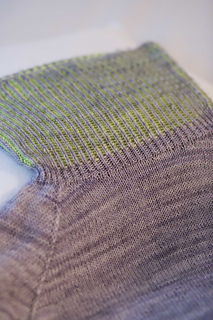 Achieving the correct row gauge is not crucial for the Brioche stitch.